Remembrance Sunday was a particularly notable occasion for two new ringers at Oxted, Surrey. 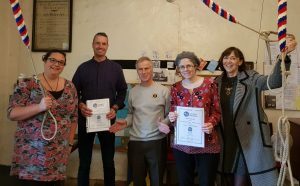 Stuart Brett and Katie Knowles were both presented with their LtR L1 certificates after ringing for the service with other band members. Both ringers are now progressing with their foundation skills and working towards Level 2. Ian Griffiths (middle) presenting L1 certificates to Stuart and Katie. Nikki Paintin (left) and Rosalyn Dale (right) are members of the Oxted Band.